Time for some warm Mediterranean colour? Historic Orange is a good start. Or the wild white horses and pink flamingos of the Camargue marshlands. Sun-baked terracotta rooflines, lavender and the milky yellow of real pastis – not to mention the bright broad arches of some of the finest Roman architecture in France. We can’t pinpoint which bit of Provençal light or shade you’ll find the most appealing, but we’d like to share some background to a few of our favourite colourful places included in our cycling holidays in France. 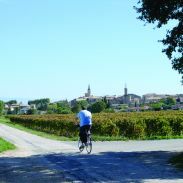 Find out more about cycling in Provence bike tours. 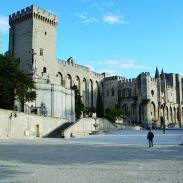 The old capital of Provence, this city has retained a great deal of its 17th and 18th C. character. View the grand mansions, tranquil fountains and wide avenues. Enjoy a coffee on one of the busy café terraces and sample the local calissons (sugar coated almonds). Visit St. Saveur – an imposing cathedral with varying styles of architecture ranging from the 5th to the 17th C.
The largest city in France, and today a central market for agricultural produce. Arles was once a Roman capital, and then a major Christian centre. This rich history is seen throughout the city in its amazing historic architecture, which includes the Roman Amphitheatre, the Alyscamps burial grounds and the Roman baths of Constantin. The city has attracted many famous artists including Van Gogh, who arrived in Arles in 1888 and Picasso who was inspired by the city’s bullfights. 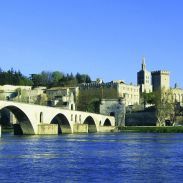 Avignon is situated on the banks of the River Rhone. The city is known for its Festival d’Art Dramatique – a mix of theatre, drama and music held each July. Sights include it’s impressive cathedral and the spectacular Palais des Papes (Palace of the Popes) – a maze of galleries, chambers, chapels and passages. The sightseeing train offers a great way to get an overview. 15th C. as sea vessels could store their goods duty-free before being transported on further by riverboat or road transport. The village of Caderousse was probably founded in pre-Roman times on what was then a peninsula formed by the confluence of the Rhône and the Aigues. The rivers provided security from invasion but also made the village vulnerable to flooding. Justice – an old bishop’s palace from the 17th C.
This town has given its name to many prestigious Rhône wines with the original vineyard having been planted here in the 14th C. Today some three hundred vineyards grow vines over 3,300 hectares and the town is almost entirely dedicated to wine production. Visit the Chateau des Papes, a ruined fortress from which you can behold an amazing view of the Rhône Valley. There is also a museum depicting the stages of wine production, from being grown in the vineyard, through to its treatment, harvesting, bottling and corking. 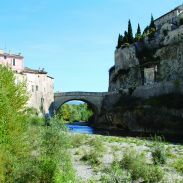 Set at the foot of the Plateau de Vaucluse, this island town was once an active industrial centre and has a number of canals running between narrow ancient streets. Famous for it’s water wheels, bridges, art galleries and antique shops, L´Isle-sur-la-Sorgue is well worth a visit. There is an antiques fair here every Easter and some 330 permanent antique dealers and second hand shops. The oldest of French cities, Marseille is also the second largest and is home to a thriving oil industry, an airport and the largest commercial port in France. Historic sites to visit include the Vieux Port – the picturesque old port and Notre-Dame-de-la-Garde, a 19th C. basilica. Visit the Quartier du Panier to see the old town, and explore Marseille’s beautiful narrow streets filled with tall colourful buildings. 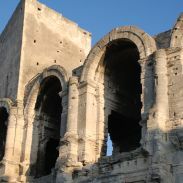 Nîmes has a rich Roman history and is home to several important remains from the Roman empire including a well-preserved elliptical Roman Amphitheatre, an Augustinian gate, the ruin of Diana’s Temple and the Maison Carrée – a former Roman temple. Today Nîmes is a popular tourist destination, and is the French centre for bullfighting. Orange is famous for its remarkable Roman theatre, which is still in use today, and the Arc de Triomphe – a triple arc constructed to celebrate the campaigns of the second Roman legion. The old town (Vieil Orange) is full of lively cafés and restaurants, as well as narrow streets, ancient squares and colourful buildings. Other sites to visit include the ancient cathédrale of Notre Dame and the Musée Muncipal – a museum occupying a former palace, which contains additional remnants of Roman history, details of local traditions and paintings. This town is named after the 36 or so fountains that you will see here, all of which are fed from a large natural spring including the Fontaine du Cormoron with its outspread wings. 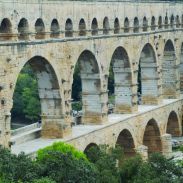 The Pont du Garde is an aqueduct built by the Romans to carry water from the ‘Source d’Eure’ spring in Uzès to Nîmes. It is a World Heritage Site, and attracts over 1.5 million tourists every year. The Pont du Garde is 275 metres long and almost 50 metres high, making it the highest bridge of the Roman Empire. St. Valentine and the market square. St. Gilles is home to the Portal of Saint Gilles, which is world famous and serves as a model for many other Roman portals. In the middle ages, the town was an important stopping point for Christian pilgrims on the way of St. James, as the abbey held the remains of Aegidius who was said to have protected them against all harm. St. Gilles is the birthplace of Pope Clemens IV and there is now a museum in the town where you can learn about the history of the pilgrims of St. James. The town has a large square, a good selection of cafés and restaurants and has retained an individual character. atmosphere – particularly on market days. It’s ancient streets are lined with restored houses, art galleries, museums, restaurants and boutiques – and the town is a popular tourist destination. The artist Van Gogh painted over 150 paintings of the countryside surrounding St. Remy, and his memory is preserved here in the ancient Monastere de St-Paul-de-Mausole, a monastery where he was interned in 1889. 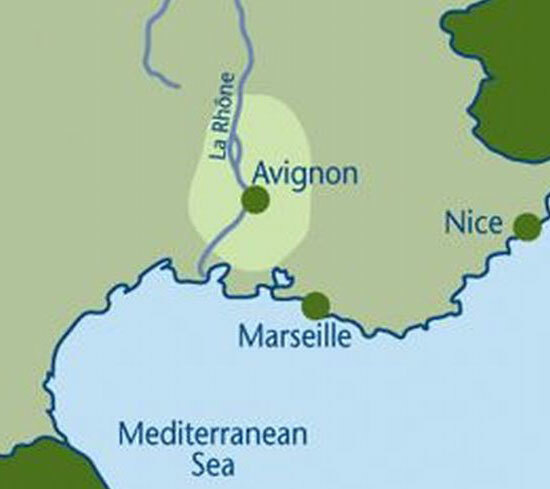 The town also contains the excavations of the Roman city of Glanum and important Roman monuments – such as the l’Arc de Triomphe and the Mausolée des Antiques. This is a picturesque village, steeped in the traditions of wine, with a wonderful open bell tower. Tarascon is a town located on the River Rhône. Here you will find a magnificent castle called Le Chateau du Roi Rene, which was built on the site of a Roman camp. Legend has it that a mythological monster known as the ‘Tarasque’ used to live here at the turn of the 1st C. devouring children, cattle and anyone trying to cross the river. To this day, the capture of this beast is celebrated with an annual fete. The town is full of character, with narrow streets, restored houses and old stone buildings. Uzès is a charming medieval town that hosts one of the most colourful Saturday markets in the South of France. Built on the tip of a limestone plateau, it overlooks the Alzon Valley and is a maze of small streets and shady squares. In the centre there are many fine 16th C. houses, which date back to the time when Uzès was a wealthy textile centre. Of note are the Place aux Herbes – a picturesque asymmetrical square surrounded by plane trees, and the Tour Fenestrelle, a relic of the former Romanesque cathedral. bridge – an impressive 17m arch bridge dating back to the 1st C.